Yesterday Charlotte stayed home from school in the morning because she thought she was gonna throw up. I love being a parent. After a few hours she felt better, but then had a headache. Around 1 she started to feel better but it was a few hours before school ended so I just kept her home. She decided to do some crafting (such a daughter of mine some days) and here is a great craft she made and wanted me to share with you all! 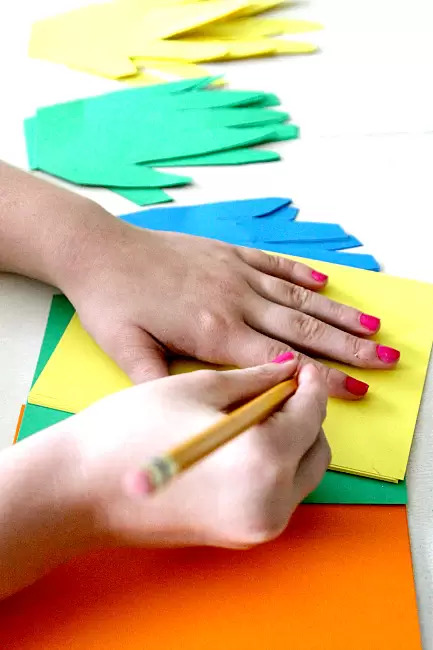 This is an easy paper activity and needs little more than construction paper and staples. You can do this with any age child as long as you have someone to supervise the cutting if they are young. Or try this St. Patrick’s Day Rainbow Snack Cup as well! Because this craft is fairly obvious, I am going to mainly showcase it in pictures. Just trace a left hand and a right hand and cut out. We cut out 3 for each side (6 total in each color) but if you want a bigger rainbow you may want more. Once you have your hand prints, just staple together in a rainbow! TIP: If you are a teacher, this would be a great bulletin board idea. 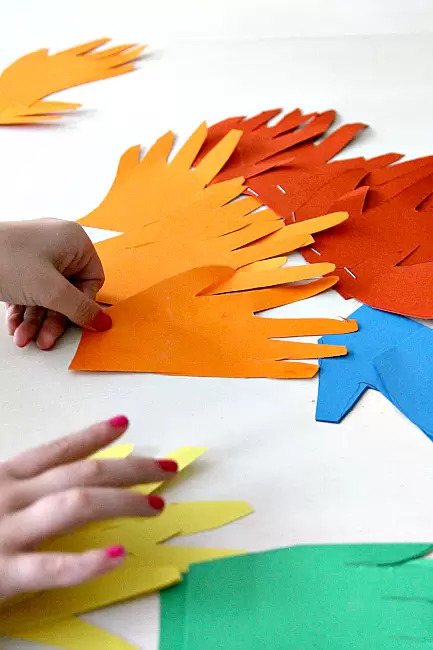 Just have the kids cut out their hands and staple into a rainbow. Use cotton balls as the clouds on either side! I love this. I want to make one for my front door. AND OMG how big is Charlotte getting? Where has the time gone? This is so cute and clever. I’m going to pass it on to my son’s Kindergarten teacher too. That’s so fun and so colorful and would be great on the fridge for some festive cheer. I guess that your daughter is absolutely happy to make this rainbow. She definitely enjoys the process! It is such a nice idea to spend time together and just to have fun! How did you invent this idea? How pretty! Sweet T would love to do this with a little help. She did great! And so colorful. Glad she’s feeling better, too. What a cute idea! My son is home for spring break and it would be fun to try this with him. He’s almost 4 years old and at a stage where he loves crafts like this. This is a cute idea. I think it would be good for an equal rights day too. 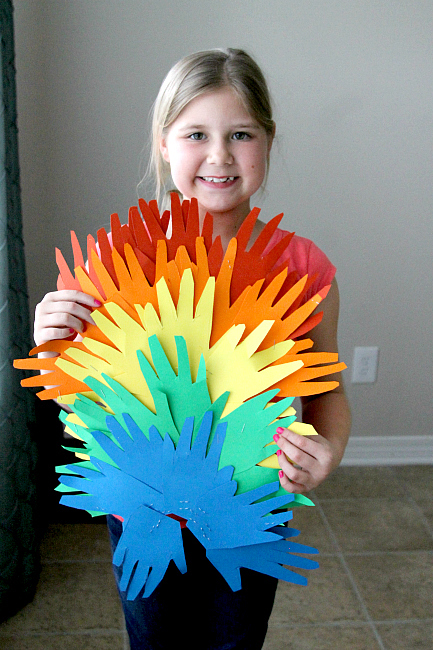 Super fun and colorful craft! I’ll have to do this with Zoe, she’d love it. That’s cute. You could even make a long garland out of it. What a fun project! I think my kids would enjoy this one, too! This is so cute! I love the Oh Mom look!. This is very cute. I love the idea of using cotton balls for clouds. Such a cute project and one that all my kiddos could do together! Your daughter is growing up! She looks like she had a lot of fun with this cute craft. Charlotte is a doll! That would be very cute with the clouds, or maybe some gold coins! Love this, Trisha! I can’t believe how much C has grown up! SO much fun! Great job Charlotte! Love this! We are into handprint stuff around here! Super cute! You could totally make that into a Turkey tail too! I love St. Patrick’s Day crafts. This is super cute! 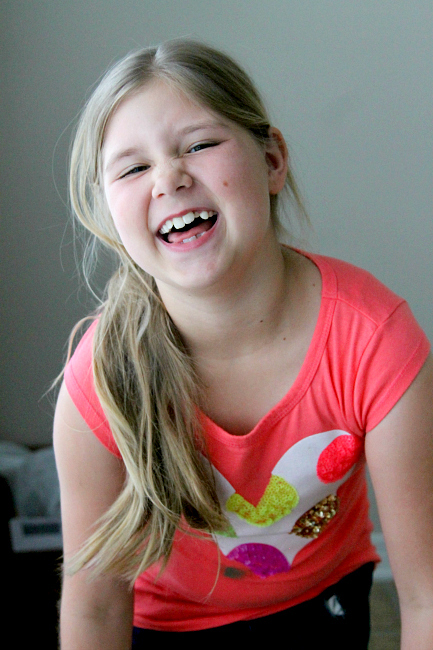 Charlotte is cracking me up, too!! My 6 year old would love this activity (he’s still not at the ‘oh mom’ stage yet, so maybe I can even get some photos! Thanks for sharing your adorable daughter too! That is a cute project. My husband is redoing our pontoon boat. The flooring is blue and the seat are blue and white. He plans to paint the outside of the boat white and have friends come over a do hand prints all over the boat. I can not imagine what it will look like but summer is coming so we shall see soon. Maybe, a design similar to this would be cute. How neat! Midge’s class DID do this on the bulletin board outside of their class last year – it was SO pretty! Love this idea! I think we’d keep it up year round too! It turned out great! I think all three of my children would like to make one of these. A perfect Spring Break activity! My daughter is absolutely going to love you for this one. Tracing her hand is one of her favorite things to do in the world… like she gets a little obsessed with it. 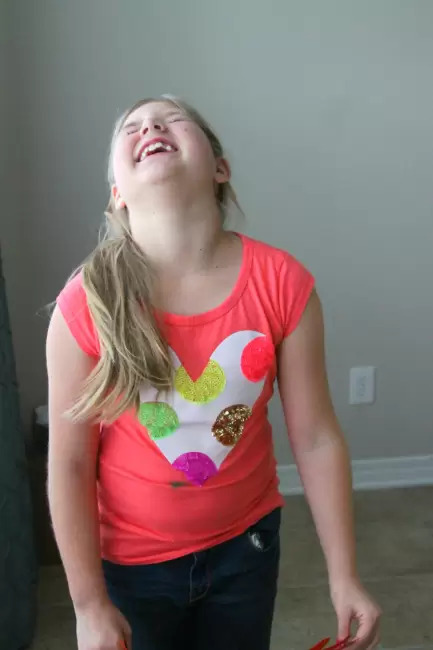 I had to laugh at your daughter’s reaction. It’s so teenage-esque. 🙂 I was doing crafts with my teenager and her friends the other night and they were taking all kinds of selfies but if I wanted to take a picture it was another story. Cute craft. I agree, it would be great for a classroom teacher.